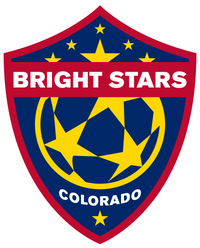 Bright Stars Developmental Program, a.k.a Recreational, is designed to give kids of all abilities a place where they get a chance to play soccer. Teams in the program are age-based with groups designated by individual birth year. The program currently recruits players 3 years old and run through all age groups up to under 19 years old. Upon registration and team assignment, players will be contacted by individual coaches shortly before the start of the season. Practices are generally held once or twice a week on a schedule determined by each individual coach. Eight games are scheduled during the season against teams from other clubs with opportunities to play in tournaments. Recreational Soccer is community based. Coaches and referees are volunteers and parent volunteers who receive guidance and materials from our Technical Director and club Directors. We run programs in Aurora. To find out about a program you can talk to one of our coaches. The primary objective of our recreational program for children 3-7 years old is to provide children an equal opportunity to learn the game of soccer. We work really hard in providing a fun and stimulating environment in an effort in making the learning of the game as enjoyable as possible, maintaining a healthy approach to ease children into competitive soccer. Through the Grass Roots development sessions, players will learn the fundamentals of soccer, build confidence, and ultimately learn the dynamics and value of a team sport. The program will always be open to all those that are not part of the academy during the school holidays. The Bright Stars soccer club's program for 8-18 year-old is designed to ease the sometimes difficult transition between recreational and competitive play. Winning games is not the focus of this recreational program, and while games will be played, scores are not kept for our younger players. Through this program, players will master the skills and fundamentals needed to progress into more aggressive soccer competition or the older age group. New players are placed in teams on a first-come-first-serve basis and furthermore based on the player's location, staff recommendations, team/coach request. Returning players will however be given first priority for team placement if registration is paid by the registration deadline and the player is requesting to have the same team/coach. All paid fees are on a per-season basis and collected at the time of the player registration, except for miscellaneous fees(*). The commitment at registration is for the full year. *All our fees includes league and referee fees for the season. For more information on any of these programs please contact us. Call 720-262-8761 | bstars@bscsoccer.org.